At this point in the season, wins and losses for the Mets don’t hold much meaning; they’re not going to get back in the race, and I think even most of the players would admit to that now. So as enjoyable as last night’s 7-3 win may have been, it really didn’t mean much towards anything. On top of that, wins are much harder to enjoy in a lost season, especially after two playoff seasons, and especially when the team you’re watching may be about to drastically change in the coming weeks and months. All of that said though, wins are never not at least somewhat amusing, and it’s still fun to see the team explode on offense like it did in the first few innings last night. 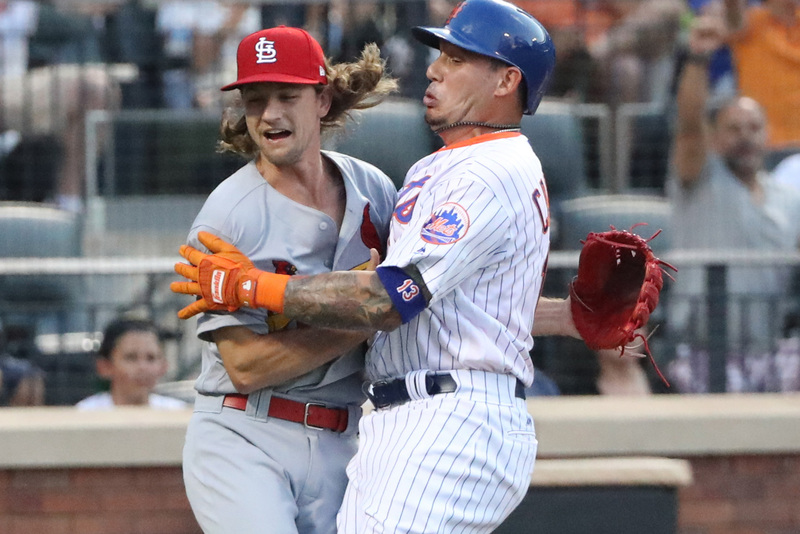 The Mets completely beat up on Mike Leake early and often. They banged out five hits and three runs in the first inning, with all three runs scoring on consecutive two-out hits by Yoenis Cespedes, Lucas Duda, and Wilmer Flores. And they weren’t done there, as the second inning saw them add four more runs on five hits, an error, and an intentional walk. An RBI single by Jay Bruce, an RBI double by Cespedes, and a two-RBI double by Jose Reyes highlighted the rally. And just like that, the Mets had erupted for a total of seven runs in just two innings off Leake, who looked very, um, leaky. For the Mets, Jacob deGrom didn’t necessarily look great early on either, and didn’t have his best stuff, only striking out three on the night. But he somehow still gutted out 6.2 innings of one-run ball. He held the Cardinals scoreless until the seventh, when he allowed an RBI double to Luke Voit off the left field wall, and that was his final batter of the night. It was the only real stumble of the game for deGrom, who scattered seven total hits and one walk over the rest of his outing. The win wasn’t without some heartache, though, because the Mets’ bullpen still had to pitch in this game. Paul Sewald was called on in the eighth inning, up 7-1 at the time. He faced four batters, walked two and got two outs, and then was relieved by Jerry Blevins with two outs and two on. Blevins gave up two hits to his first two batters, the latter of which scored the two inherited runners, and then walked a pinch-hitting Adam Wainwright. Yes, Blevins walked a pitcher who was pinch-hitting. Since June 17, Blevins has faced 38 hitters, has walked seven of them (18.4%), allowed 12 hits, and has struck out only six of them (15.4%). His control has completely abandoned him. By the way, I’m sure this is completely unrelated, but this was Blevins’ 47th appearance of the season, which ties him for the MLB lead. He has 120 appearances since the start of 2016. Whatever though, I’m sure that means nothing. Anyway, Blevins was pulled for Addison Reed, who was making his 123rd appearance since the start of 2016. Reed worked out of the jam in the eighth and pitched a scoreless ninth to record a four-out save to finish the victory, and build his trade value that much more. Rumors still continue to circulate about Reed, and his tenure on the Mets appears likely to be reaching an end very soon. Trade rumors are aplenty. The Red Sox, still in desperate need of a third baseman after missing out on Todd Frazier, have reportedly scouted three Mets players who could potentially fill that void for them: Wilmer Flores, Asdrubal Cabrera, and T.J. Rivera, though none of those players are actually third basemen. In addition to that, Ken Rosenthal wrote on Facebook that the Mets would prefer to trade Curtis Granderson to Jay Bruce, and may consider keeping Bruce and offering him a qualifying offer. It’s hard to tell if this is actually true or just a leak on the Mets part to enforce the façade that they’re not totally desperate to trade Bruce, but a qualifying offer for Bruce would be an absolute mistake. Bruce is undoubtably having a good season, but with the current market for corner outfielders, an $18-20 million qualifying offer for Bruce is a total overpay. He would not get that money on the free agent market, so he’d be very likely to accept the offer. And if he does that, then the Mets would have blown a significant portion of their offseason budget on a corner outfielder that wasn’t totally vital, despite absolutely needing upgrades at center field, third base, second base, and maybe catcher, along with at least one starting pitcher and three relievers. Not to mention the dangers of acquiring yet another player on a non-commital, one-year deal as opposed to a long-term deal, rendering it difficult to plan long-term. To put it gently, it would not be a prudent management of resources. The Mets close out the four-game set with the Cardinals at 12:10 p.m. Seth Lugo takes on Lance Lynn in the series finale. Nice analysis of why it would be a mistake to offer Bruce a qualifying offer. I really hope Mets management (and ownership) is also thinking this way. But I have my doubts.